An automobile (or motor car) is a wheeled passenger vehicle that carries its own motor. Most definitions of the term specify that automobiles are designed to run primarily on roads, to have seating for one to seven people, typically have four wheels and are constructed principally for the transport of people rather than goods. However, the term is far from precise. As of 2002, there were 590 million passenger cars worldwide (roughly one car for every ten people). Of that number, 140 million cars were in the United States, corresponding to roughly one car for every two people. The automobile is one of the technologies—along with such others as distributed electricity, the electric motor, the electric light bulb, and the telephone—that played a pivotal role in effecting wholesale change in twentieth century society. These changes range from the development of suburbs and the death of many public transit systems to the growth of malls, the replacement of traditional courtship patterns with modern dating practices, and the trend toward smaller families with the elderly segregated into assisted living facilities and nursing homes. An automobile powered by the Otto gasoline engine was invented in Germany by Karl Benz in 1885. 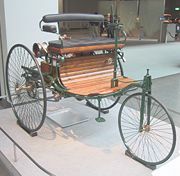 Benz was granted a patent dated January 29, 1886, in Mannheim for that automobile. Even though Benz is credited with the invention of the modern automobile, several other German engineers worked on building automobiles at the same time. In 1886, Gottlieb Daimler and Wilhelm Maybach in Stuttgart patented the first motor bike, built and tested in 1885, and in 1886 they built a converted horse-drawn stagecoach. In 1870, German-Austrian inventor Siegfried Marcus assembled a motorized handcart, though Marcus' vehicle did not go beyond the experimental stage. In 1806, François Isaac de Rivaz, a Swiss inventor, designed the first internal combustion engine (sometimes abbreviated "ICE" today). He subsequently used it to develop the world's first vehicle to run on such an engine that used a mixture of hydrogen and oxygen to generate energy. The design was not very successful, as was the case with the British inventor, Samuel Brown, and the American inventor, Samuel Morey, who produced vehicles powered by clumsy internal combustion engines about 1826. Etienne Lenoir produced the first successful stationary internal combustion engine in 1860, and within a few years, about four hundred were in operation in Paris. About 1863, Lenoir installed his engine in a vehicle. It seems to have been powered by city lighting-gas in bottles, and was said by Lenoir to have "travelled more slowly than a man could walk, with breakdowns being frequent." Lenoir, in his patent of 1860, included the provision of a carburetor, so liquid fuel could be substituted for gas, particularly for mobile purposes in vehicles. Lenoir is said to have tested liquid fuel, such as alcohol, in his stationary engines; but it does not appear that he used them in his own vehicle. If he did, he most certainly did not use gasoline, as this was not well-known and was considered a waste product. The next innovation occurred in the late 1860s, when Siegfried Marcus, a German working in Vienna, developed the idea of using gasoline as a fuel in a two-stroke internal combustion engine. In 1870, using a simple handcart, he built a crude vehicle with no seats, steering, or brakes, but it was remarkable for one reason: it was the world's first vehicle using an internal combustion engine fueled by gasoline. It was tested in Vienna in September of 1870 and put aside. In 1888 or 1889, he built a second automobile, this one with seats, brakes, and steering, and included a four-stroke engine of his own design. That design may have been tested in 1890. Although he held patents for many inventions, he never applied for patents for either design in this category. The four-stroke engine already had been documented and a patent was applied for in 1862 by the Frenchman Beau de Rochas in a long-winded and rambling pamphlet. He printed about three hundred copies of his pamphlet and they were distributed in Paris, but nothing came of this, with the patent application expiring soon afterward and the pamphlet disappearing into obscurity. Most historians agree that Nikolaus Otto of Germany built the world's first four-stroke engine although his patent was voided. He knew nothing of Beau de Rochas's patent or idea, and invented the concept independently. In fact, he began thinking about the concept in 1861, but abandoned it until the mid-1870s. In 1883, Edouard Delamare-Deboutteville and Leon Malandin of France installed an internal combustion engine powered by a tank of city gas on a tricycle. As they tested the vehicle, the tank hose came loose, resulting in an explosion. In 1884, Delamare-Deboutteville and Malandin built and patented a second vehicle. This one consisted of two four-stroke, liquid-fueled engines mounted on an old four-wheeled horse cart. The patent, and presumably the vehicle, contained many innovations, some of which would not be used for decades. However, during the vehicle's first test, the frame broke apart, the vehicle literally "shaking itself to pieces," in Malandin's own words. No more vehicles were built by the two men. Their venture went completely unnoticed and their patent unexploited. Knowledge of the vehicles and their experiments was obscured until years later. Internal combustion engine automobiles were first produced in Germany by Karl Benz in 1885-1886, and Gottlieb Daimler between 1886-1889. 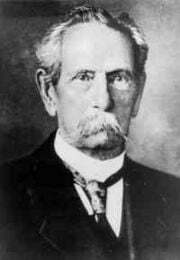 Benz began to work on new engine patents in 1878. At first he concentrated on creating a reliable two-stroke gas engine, based on Nikolaus Otto's design of the four-stroke engine. A patent on the design by Otto had been declared void. Benz finished his engine on New Year's Eve and was granted a patent for it in 1879. 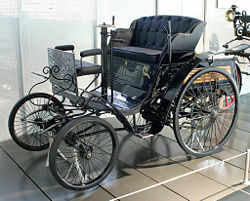 Benz built his first three-wheeled automobile in 1885 and it was granted a patent in Mannheim, dated January 1886. This was the first automobile designed and built as such, rather than a converted carriage, boat, or cart. Among other items Benz invented are the speed regulation system known also as an accelerator, ignition using sparks from a battery, the spark plug, the clutch, the gear shift, and the water radiator. He built improved versions in 1886 and 1887 and went into production in 1888: the world's first automobile production. His wife, Bertha, made significant suggestions for innovation that he included in that model. Approximately 25 were built before 1893, when his first four-wheeler was introduced. They were powered with four-stroke engines of his own design. Emile Roger of France, already producing Benz engines under license, now added the Benz automobile to his line of products. Because France was more open to the early automobiles, more were built and sold in France through Roger than Benz sold in Germany. In 1886, Gottlieb Daimler fitted a horse carriage with his four-stroke engine. In 1889, he built two vehicles from scratch as automobiles, with several innovations. From 1890 to 1895, about 30 vehicles were built by Daimler and his assistant, Wilhelm Maybach, either at the Daimler works or in the Hotel Hermann, where they set up shop after falling out with their backers. Benz and Daimler, seem to have been unaware of each other's early work and worked independently. Daimler died in 1900. During the First World War, Benz suggested a cooperative effort between the two companies, but it was not until 1926 that they united under the name of Daimler-Benz with a commitment to remain together under that name until the year 2000. In 1890, Emile Levassor and Armand Peugeot of France began producing vehicles with Daimler engines, and so laid the foundation of the motor industry in France. They were inspired by Daimler's Stahlradwagen of 1889, which was exhibited in Paris in 1889. The first American car with a gasoline internal combustion engine supposedly was designed in 1877 by George Baldwin Selden of Rochester, New York, who applied for a patent on an automobile in 1879. Selden did not build an automobile until 1905, when he was forced to do so, due to a lawsuit threatening the legality of his patent because the subject had never been built. After building the 1877 design in 1905, Selden received his patent and later sued the Ford Motor Company for infringing upon his patent. Henry Ford was notorious for opposing the American patent system and Selden's case against Ford went all the way to the Supreme Court, which ruled that Ford, and anyone else, was free to build automobiles without paying royalties to Selden, since automobile technology had improved so significantly since the design of Selden's patent, that no one was building according to his early designs. In Britain there had been several attempts to build steam cars with varying degrees of success with Thomas Rickett even attempting a production run in 1860. One of the major problems was the poor state of the road network. Santler from Malvern is recognized by the Veteran Car Club of Great Britain as having made the first petrol powered car in the country in 1894 followed by Frederick William Lanchester in 1895 but these were both prototypes. The first production vehicles came from the Daimler Motor Company, founded by Harry J. Lawson in 1896, and making their first cars in 1897. Some sources suggest that Ferdinand Verbiest, whilst a member of a Jesuit mission in China, may have built the first steam powered car around 1672. Another early self-propelled vehicle was that built by Nicolas-Joseph Cugnot, a French inventor, in 1765. The first automobile patent in the United States was granted to Oliver Evans in 1789 for his "Amphibious Digger." It was a harbor dredge scow designed to be powered by a steam engine and he built wheels to attach to the bow. In 1804 Evans demonstrated his first successful self-propelled vehicle, which not only was the first automobile in the U.S. but was also the first amphibious vehicle, as his steam-powered vehicle was able to travel on wheels on land as he demonstrated once, and via a paddle wheel in the water. It was not successful and was eventually sold as spare parts. The Benz Motorwagen, built in 1885, was patented on January 29, 1886, by Karl Benz as the first automobile powered by an internal combustion engine. In 1888, a major breakthrough came when Bertha Benz drove an automobile that her husband had built for a distance of more than 106 kilometers (about 65 miles). This event demonstrated the practical usefulness of the automobile and gained wide publicity, which was the promotion she thought was needed to advance the invention. The Benz vehicle was the first automobile put into production and sold commercially. Bertha Benz's historic drive is celebrated as an annual holiday in Germany with rallies of antique automobiles. In 1892, Rudolf Diesel got a patent for a "New Rational Combustion Engine" by modifying the Carnot Cycle. And in 1897 he built the first diesel engine. On November 5, 1895, George B. Selden was granted a United States patent for a two-stroke automobile engine (U.S. Patent 549160 (PDF)). This patent did more to hinder than encourage development of autos in the United States. Steam, electric, and gasoline powered autos competed for decades, with gasoline internal combustion engines achieving dominance in the 1910s. The large-scale, production line manufacturing of affordable automobiles was debuted by Ransom E. Olds at his Oldsmobile factory in 1902. This assembly line concept was then greatly expanded by Henry Ford in the 1910s. Development of automotive technology was rapid, due in part to the hundreds of small manufacturers competing to gain the world's attention. 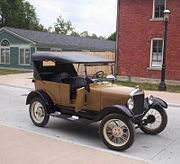 Key developments included electric ignition and the electric self-starter (both by Charles Kettering, for the Cadillac Motor Company in 1910-1911), independent suspension, and four-wheel brakes. Since the 1920s nearly all cars have been mass-produced to meet market needs, so marketing plans have often heavily influenced automobile design. 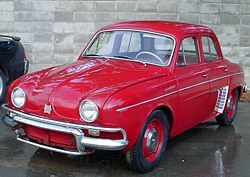 It was Alfred P. Sloan who established the idea of different makes of cars produced by one firm, so that buyers could "move up" as their fortunes improved. The makes shared parts with one another so that the larger production volume resulted in lower costs for each price range. For example, in the 1950s, Chevrolet shared hood, doors, roof, and windows with Pontiac; the LaSalle of the 1930s, sold by Cadillac, used the cheaper mechanical parts made by the Oldsmobile division. In 2005, 63 million cars and light trucks were produced worldwide. World Motor Vehicle Production by Country and Type: Cars 2004 - 2005. OICA. World Motor Vehicle Production by Country and Type: Light Commercial Vehicles 2004 - 2005. OICA. Large free trade areas like European Union, NAFTA and MERCOSUR attract manufacturers worldwide to produce their products within them reducing currency risks and customs controls and additionally being close to their customers. Thus the production figures do not show the technological ability or business skill of the areas. In fact much, if not most, of Third World countries car production uses Western technology and car models and sometimes complete Western factories are shipped to such countries. This is reflected in patent statistics as well as the location of R&D centers. The automobile industry is dominated by relatively few large corporations (not to be confused with the much more numerous brands), the biggest of which (by numbers of cars produced) are currently General Motors, Toyota and Ford Motor Company. 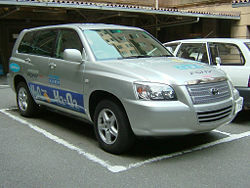 It is expected that Toyota will reach the No. 1 position in 2009. The most profitable per-unit car-maker of recent years has been Porsche due to its premium price tag. World motor vehicle production by manufacturer: World ranking 2005. OICA (June 2006). The future of the car is controversial. There have been many efforts to innovate automobile design funded by the NHTSA, including the work of the NavLab group at Carnegie Mellon University. Recent efforts include the highly publicized DARPA Grand Challenge race. Relatively high transportation fuel prices have not seriously reduced car usage but do make it more expensive. One environmental benefit of high fuel prices is that it is an incentive for the production of more efficient (and hence less polluting) car designs and the development of alternative fuels. At the beginning of 2006, one liter of gasoline cost approximately US$0.60 in the United States and in Germany and other European countries nearly US$1.80. With fuel prices at these levels there is a strong incentive for consumers to purchase lighter, smaller, more fuel-efficient cars, or to simply not drive. These changes are resisted by those with an interest in maintaining the massive economy of car culture. Individual mobility is highly prized in dominant societies so the demand for automobiles is still strong. Alternative individual modes of transport, such as personal rapid transit, cycling, walking, skating, and organized cargo movement, could serve as an alternative to automobiles if they prove to be socially accepted. Electric cars operate a complex drivetrain and transmission would not be needed. However, despite this the electric car is held back by battery technology—a cell with comparable energy density to a tank of liquid fuel is a long way off, and there is no infrastructure in place to support it. A more practical approach may be to use a smaller internal combustion (IC) engine to drive a generator—this approach can be much more efficient since the IC engine can be run at a single speed, use cheaper fuel such as diesel, and drop the heavy, power wasting drivetrain. Such an approach has worked very well for railway locomotives, but so far has not been scaled down for car use. Increasing costs of oil-based fuels and tightening environmental laws with the possibility of further restrictions on greenhouse gas emissions are propelling work on alternative power systems for automobiles. Many diesel-powered cars can run with little or no modifications on 100 percent pure biodiesel. The main benefit of diesel combustion engines is its 50 percent fuel burn efficiency compared with 23 percent in the best gasoline engines. Most modern gasoline engines are capable of running with up to 15 percent ethanol mixed into the gasoline fuel—older vehicles may have seals and hoses that could be harmed by ethanol. With a small amount of redesign, gasoline-powered vehicles can run on ethanol concentrations as high as 85 percent. One-hundred percent ethanol is used in some parts of the world using vehicles that must be started on pure gasoline and switched over to ethanol once the engine is running. Most gasoline-fueled cars can also run on LPG with the addition of an LPG tank for fuel storage and carburation modifications to add an LPG mixer. LPG produces fewer toxic emissions and is a popular fuel for forklift trucks that have to operate inside buildings. The first electric cars were built in the late 1800s, prior to combustion engine automobiles, nevertheless attempts at building viable, modern battery-powered electric vehicle began with the introduction of the first modern (transistor controlled) electric car. Current research and development is centered on "hybrid" vehicles that use both electric power and internal combustion. Research into alternative forms of power also focus on developing fuel cells, Homogeneous Charge Compression Ignition (HCCI), and even using the stored energy of compressed air or liquid nitrogen. Alternative forms of combustion such as gasoline direct injection (GDI) are starting to appear in production vehicles. 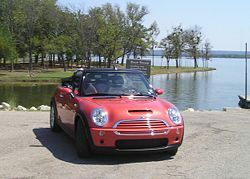 GDI is employed in the 2007 BMW MINI Cooper. The design of modern cars is typically handled by a large team of designers and engineers from many different disciplines. As part of the product development effort the team of designers will work closely with teams of design engineers responsible for all aspects of the vehicle. These engineering teams include: chassis, body and trim, powertrain, electrical and production. The design team under the leadership of the design director will typically comprise of an exterior designer, an interior designer (usually referred to as stylists) and a color and materials designer. A few other designers will be involved in detail design of both exterior and interior. For example, a designer might be tasked with designing the rear light clusters or the steering wheel. The color and materials designer will work closely with the exterior and interior designers in developing exterior color paints, interior colors, fabrics, leathers, carpet, wood trim and so on. In 1924 the American national automobile market began reaching saturation. To maintain unit sales, General Motors instituted annual model-year design changes in order to convince car owners that they needed to buy a new replacement each year. Since 1935 automotive form has been driven more by consumer expectations than by engineering improvement. Automobile accidents are almost as old as automobiles themselves. Early examples include Joseph Cugnot, who crashed his steam-powered "Fardier" against a wall in 1771, Mary Ward, who became one of the first documented automobile fatalities on August 31, 1869, in Parsonstown, Ireland, and Henry Bliss, one of the United State's first pedestrian automobile casualties on September 13, 1899, in New York City. Cars have many basic safety problems—for example, they have human drivers who make mistakes, wheels that lose traction when the braking or turning forces are too high. Some vehicles have a high center of gravity and therefore an increased tendency to roll over. When driven at high speeds, collisions can have serious or even fatal consequence. Significant reductions in death and injury have come from the addition of safety belts and laws in many countries to require vehicle occupants to wear them. Airbags and specialized child restraint systems have improved on that. Structural changes such as side-impact protection bars in the doors and side panels of the car mitigate the effect of impacts to the side of the vehicle. Many cars now include radar or sonar detectors mounted to the rear of the car to warn the driver if he or she is about to reverse into an obstacle or a pedestrian. Some vehicle manufacturers are producing cars with devices that also measure the proximity to obstacles and other vehicles in front of the car and are using these to apply the brakes when a collision is inevitable. There have also been limited efforts to use heads up displays and thermal imaging technologies similar to those used in military aircraft to provide the driver with a better view of the road at night. There are standard tests for safety in new automobiles, like the EuroNCAP and the USNCAP tests. There are also tests run by organizations such as the Insurance Institute for Highway Safety (IIHS) and backed by the insurance industry. Despite technological advances, there is still significant loss of life from car accidents: About 40,000 people die every year in the United States, with similar figures in Europe. This figure increases annually in step with rising population and increasing travel if no measures are taken, but the rate per capita and per mile traveled decreases steadily. The death toll is expected to nearly double worldwide by 2020. A much higher number of accidents result in injury or permanent disability. The highest accident figures are reported in China and India. The European Union has a rigid program to cut the death toll in its member countries in half by 2010 and member states have started implementing measures. Automated control has been seriously proposed and successfully prototyped. Shoulder-belted passengers could tolerate a 32G emergency stop (reducing the safe inter-vehicle gap 64-fold) if high-speed roads incorporated a steel rail for emergency braking. Both safety modifications of the roadway are thought to be too expensive by most funding authorities, although these modifications could dramatically increase the number of vehicles that could safely use a high-speed highway. Acceleration, braking, and measures of turning or agility vary widely between different makes and models of automobile. The automotive publication industry has developed around these performance measures as a way to quantify and qualify the characteristics of a particular vehicle. The automobile is one of the key technologies in the cluster of major technologies that began transforming modern life in the first decades of the twentieth century. In 1929 the U.S. automotive industry produced 5.5 million vehicles, making it the largest manufacturing industry in the world. Employing tens of thousands of workers, the industry itself was a major contributor to the rise of the middle class in the United States; but perhaps even more significantly, the cars were a genie unleashed in a land of ambitious and creative people. Whereas people at first had bought cars to simplify such tasks as traveling from the farm to the nearby town, they soon began using them for touring to see the country, bringing a new commercial vitality to many previously remote locations. As young people discovered the mobile private space of the car, this new mode of transportation became a great facilitator of the new practice of dating, which largely displaced traditional patterns of chaperoned courtship. As the cars became less expensive to buy and easier to operate, and as the infrastructure of roads, traffic lights, and refueling stations proliferated, the automobile was ready to serve the long-standing predilection, especially in the United States, toward individual freedom of movement, action, and living. Lacking clarity about the responsibilities necessarily associated with freedom and without any higher guiding principle of how to live together as a people, Americans got into their cars and spread out away from the city centers, creating huge suburban areas where each family had its own private territory of a house surrounded by a green grass lawn. Soon state and local zoning laws were enforcing separation of commercial and residential areas, sealing a trend already underway that was making it increasingly impossible to walk to work or the corner grocery store. The proliferation of the car meant the death of many of the trolley systems that had developed early in the twentieth century in urban centers and it also contributed to the separation of classes in which those who could afford the car and the costs of suburban living (and who were usually white) moved to the suburbs, leaving behind a poorer class. With the flight to the suburbs, small stores throughout the cities lost many of their customers who needed new shopping areas in the suburbs catering to customers driving cars. And so, over time, the car played midwife to the birth of the suburban shopping center, and later the warehouse discount stores, shopping malls, and mega-malls of the late twentieth century. With the necessity of driving being built into the suburbs, and with the car's limitation on the number of people it could carry, the car would have been one of the many factors pushing toward the smaller and separate nuclear family of parents with no more than 3 or 4 children—and no grandparents. Large suburbs with no walking access to shopping areas were particularly unsuited to aging grandparents, so the car must be considered as one of the strong factors leading to the network of assisted living facilities and nursing homes in the United States now housing millions of aged and incapacitated grandparents separated from their families. The social transformation in the twentieth century wrought by the automobile allied with a multitude of other technologies can serve as an important case study for gaining perspective on the even greater social transformation now underway due to the development of the Internet, an integrative technology even more potent than the automobile. ↑ Passenger cars. Worldmapper. Retrieved July 11, 2007. ↑ SA Motoring History - Timeline. Government of South Australia. Retrieved July 11, 2007. ↑ SaferCar.gov National Highway Traffic Safety Administraion. Retrieved July 18, 2007. ↑ Insurance Institute for Highway Safety Retrieved July 11, 2007. All links retrieved May 3, 2016. This page was last modified on 3 May 2016, at 14:47.